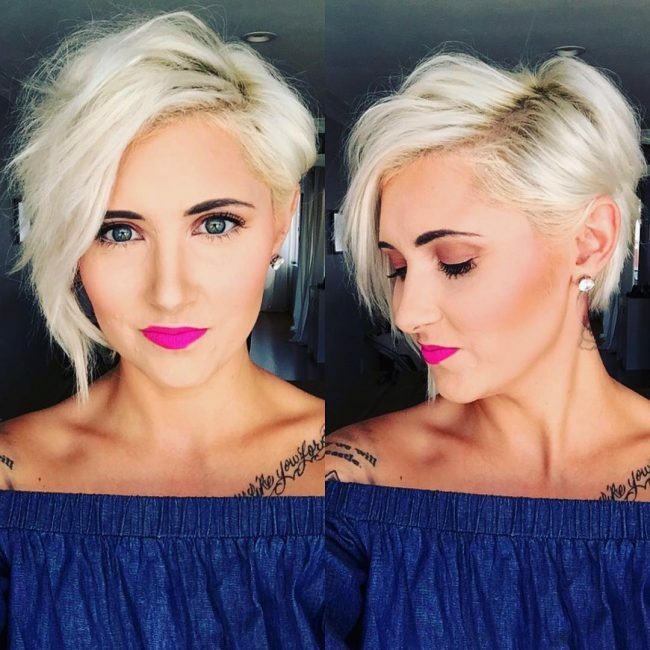 50 Trendy Short and Long Pixie Haircut Styles — Cutest of All! 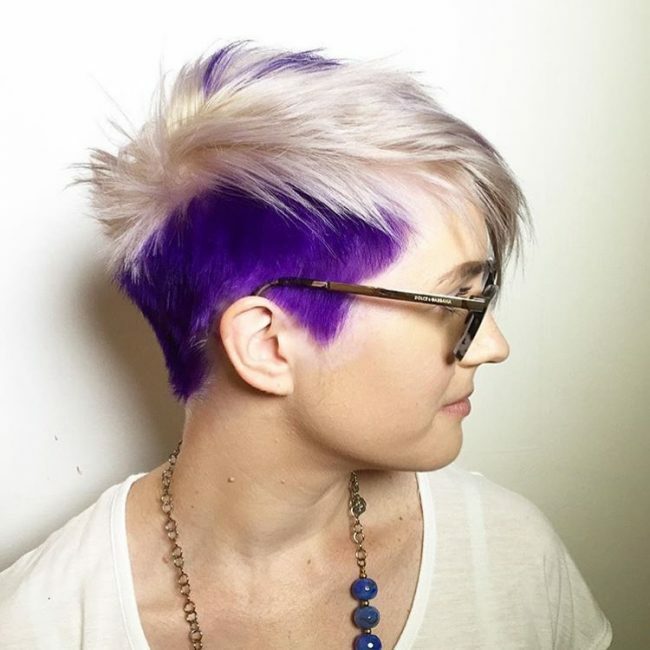 The yellow blonde balayage shade on this haircut is the first thing that will catch your attention because it is unique. 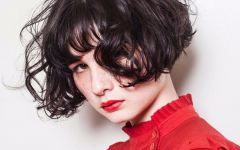 However, this hairdo would not look this adorable without the fancy trim that entails leaving some extra-long wavy bangs that you should style with a side sweep and by making them slightly messy. 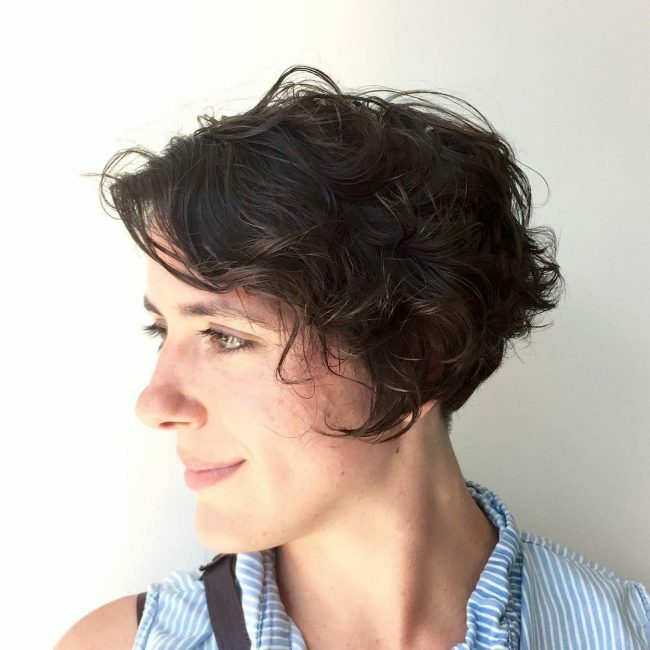 Some ladies prefer to make their strands as short as possible while still maintaining enough length for styling, and if you are among them, this cut will work for you. It is a simple short side and long top but with a smooth taper at the back. And for styling you only need to sweep the long bangs on top diagonally over the forehead. 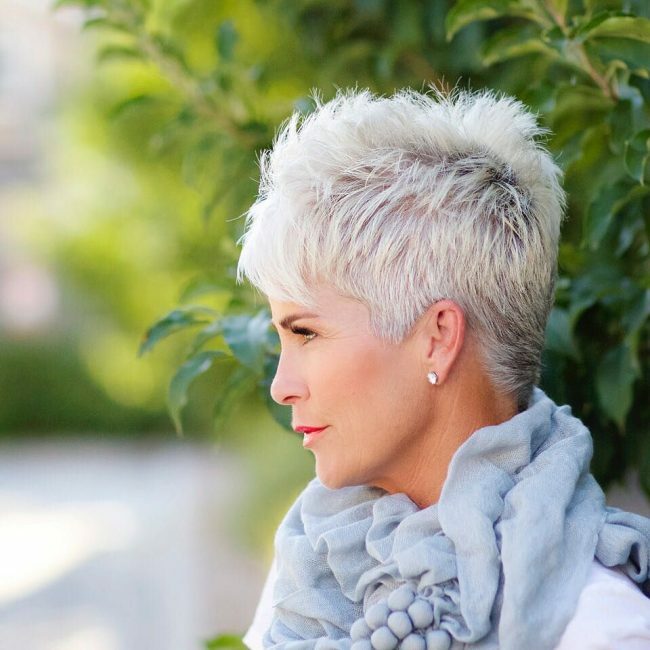 This sassy haircut looks amazing on the oval face, and it helps to accentuate all its beautiful features. The textures on the cut are splendid, and the dimensions of the razor cut are also adorable. This design also has some cute bangs that you can style with your fingers and a tapered back to make them look trendy. And for styling you only need to layer your bangs expertly. 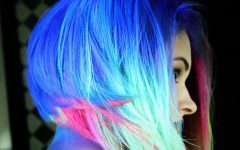 Color has an immense effect on your hairdo, and it is one of the things that make this a trendy hairstyle. This hairdo entails chopping the strands to form some textured bangs on the crown and tapering the sides to expose the dark section of the hair that brings out the two-toned appearance. This headdress maintains an almost equal length throughout the head, but it has a very edgy cut and styling that makes it look exquisite. To replicate it you should crop your stands and also give them a line up before sweeping them to the sides in subtle layers. A pixie hairdo will work for any hair, and so these sweet spirals are not an exception. To make yours look this fantastic, you only need to make them longer at the top and give them a moderate tapering at the back. And to finish the design you should form a soft side part and sweep a few of them frontwards over the forehead. 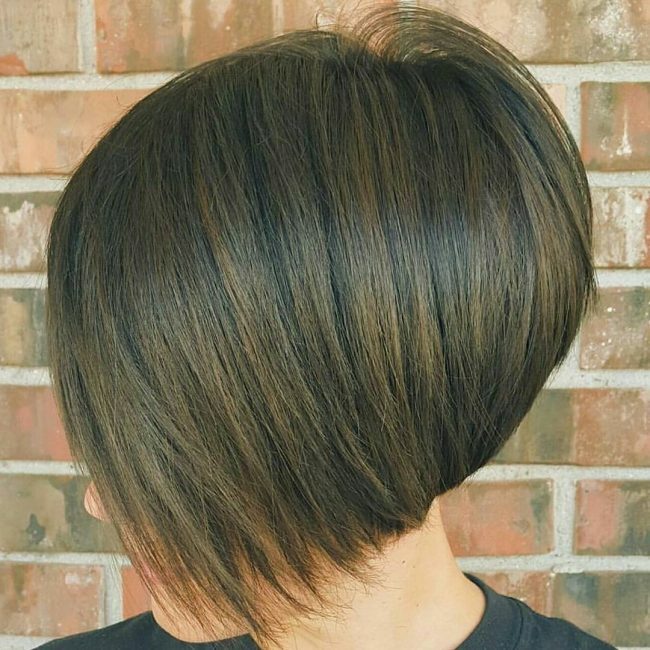 Although the back of this hairdo looks shorter than the top it is not. In fact, the strands have a uniform length throughout but their styling makes the back appear shorter. To create this look, you should first scissor trim your thick wavy locks and then style by sweeping them to the sides in subtle layers. Your natural curls will give you the opportunity to wear anything that you can think of and still look stunning. 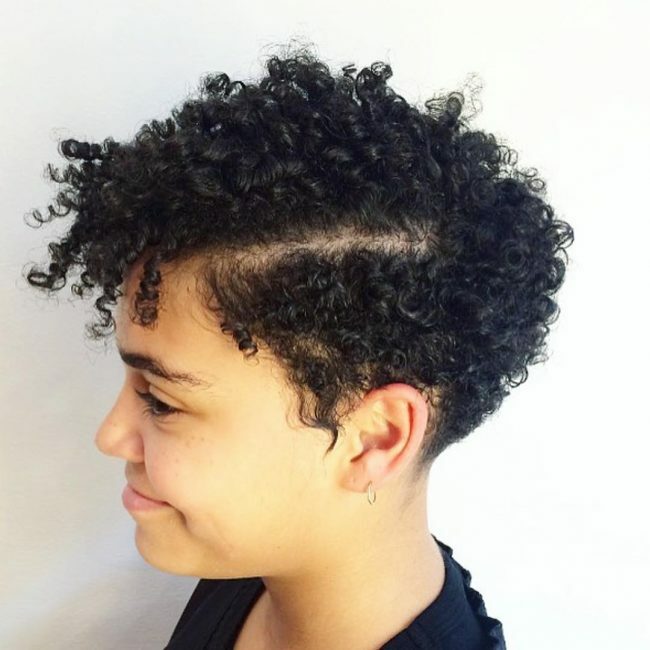 This particular style will entail chopping your natural curly textured locks in an asymmetrical design and then style them with an inventive side sweep. You should also use your fingers to make your curls slightly messy as this gives them a more natural looking finish. It is hard to believe that this hair is natural and most people will think that it is a weave because it looks very perfect. The style entails chopping the strands into a uniform short length and also tapering the back slightly. You should then arrange the resulting bangs keenly and carefully to create a lovely layered look. These strands are very soft, and they have a dazzling dark tone that also adds to their beauty and also makes the wearer look neat and classy. 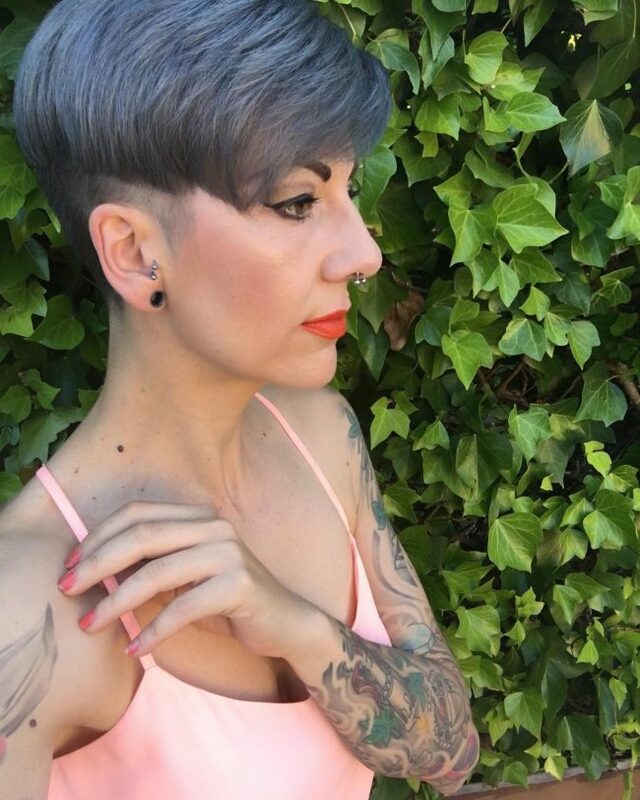 The brightening effect of pastel shades can transform any hairstyle into something magnificent. 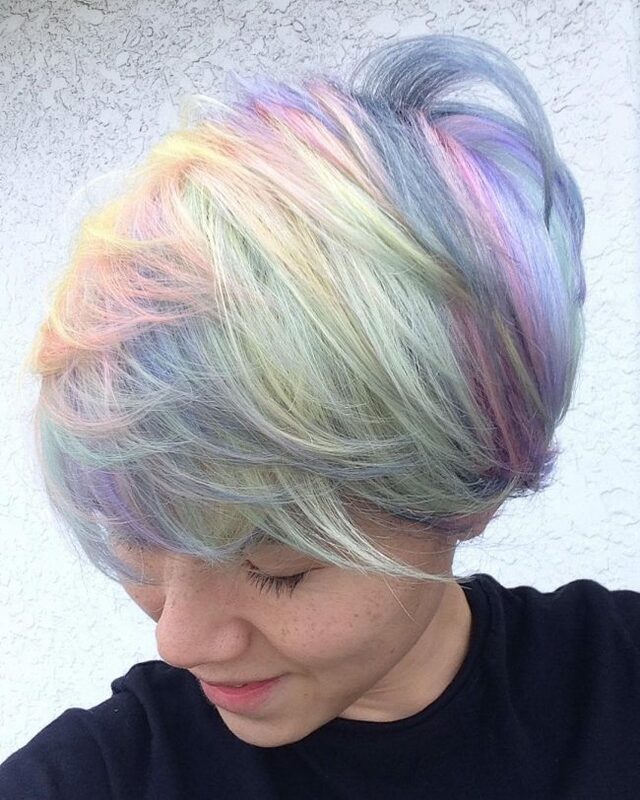 However, there is still way much more to this fancy haircut that the rainbow pastel shades. 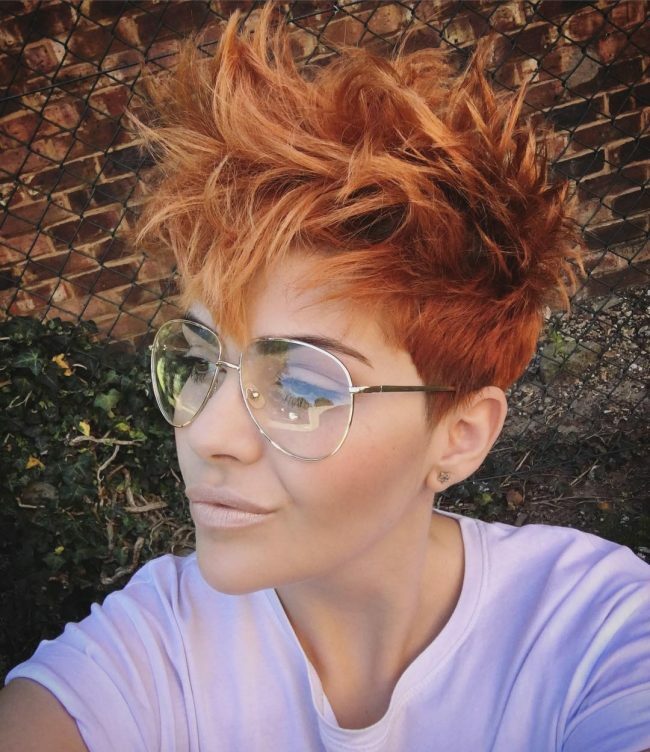 These strands are as thick as it can get and to create this look you should leave them longer than what you find in the traditional pixie haircut. The next step is to give the strands the lovely pastel hues and for this, you will need to use a shade of pink, purple and blue. The last step and equally important is the styling, but it is easy to achieve as you only have to sweep the thick locks to one side in subtle layers and over the forehead. 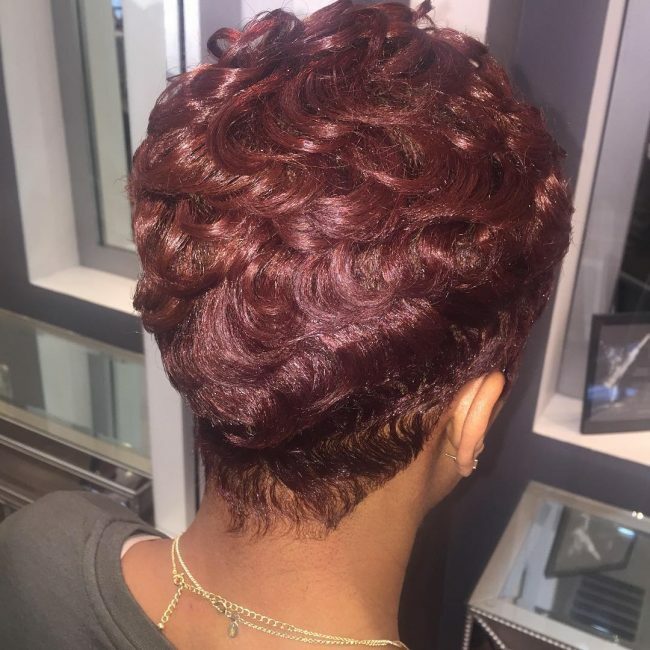 This beautiful hairdo is all about the texture, and so any woman can replicate it easily. To create this look, you have to chop your strands into short textured bangs and then style by sweeping them sideways in subtle layers. And although you can have it in any color, it looks best with blonde hues. The beauty of this hairdo comes from the messy styling of the bangs on the crown. However, you cannot achieve this eye-catching look without the right cut. To create this look, you will only need to leave some long textured bangs on top and then give the sides a smooth taper. And to finish your elegant look you should run your fingers through the long bangs on the crown to make them messy. The brown shade of the locks is also beautiful, but you can replicate it effortlessly. 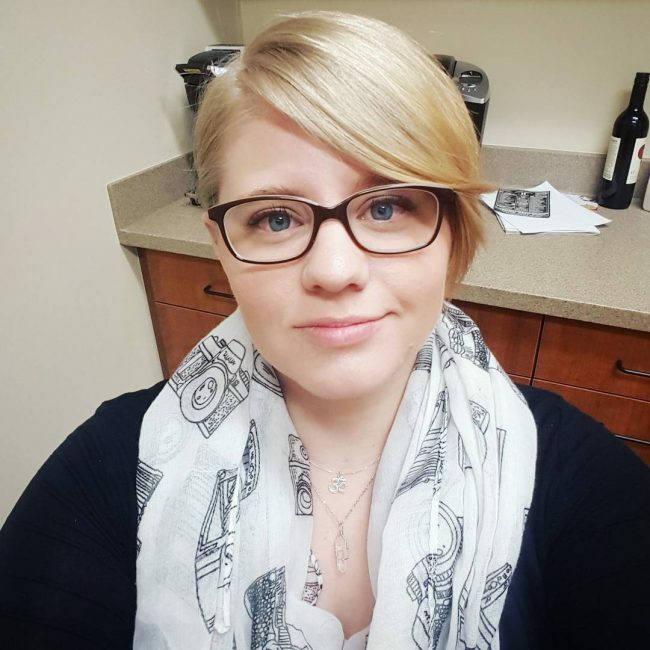 Even a perfect color like this platinum blonde will still need a good haircut to look gorgeous. This headdress maintains some extra-long locks throughout the head and they also have an excellent volume and texture. And for styling, you will only need to form a soft side part and then sweep the long locks to the sides in subtle stacks. This haircut maintains hair only on the crown, but it still looks stunning. It also has a lovely undercut on the sides, but the smoothness of the locks and their styling is what makes the wearer look exquisite. 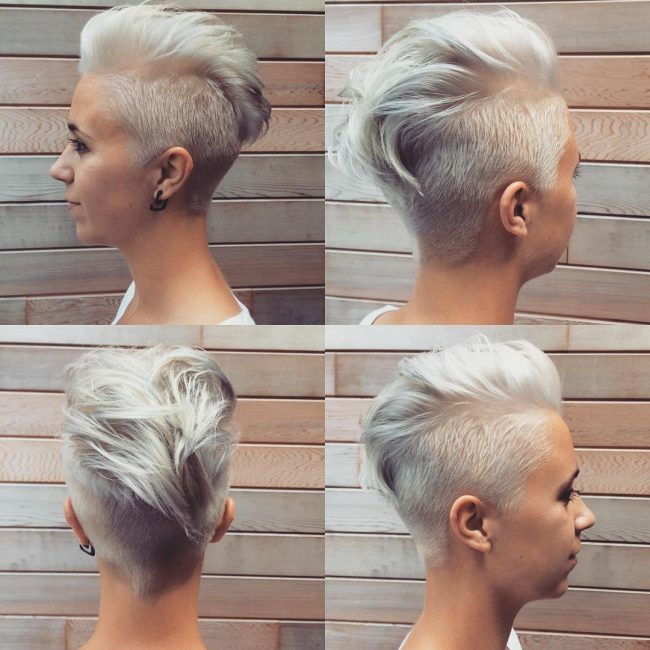 The undercut is easy to create as you only need to chop the sides short and give them a fade. However for the styling on top, you will need to comb over your smooth and straight strands. Their grayish shade is also fantastic, and it is what creates the smoky appearance. Although these strands are quite thin, they still look stunning, and this proves that a pixie can work for any hair. To create this look on your thin strands, you will need to chop them short to form some spiky strands and taper the sides to make them short. You also have to get a platinum blonde dye job and then finish your style by up sweeping the spikes on the crown. This headdress is very straightforward, and you can have it in a matter of minutes, and it will work for any hair type. Here you only have to maintain some textured medium length bangs on the crown and taper the sides and back or just make them shorter. And for styling you should sweep the long top locks sideways and layer them slightly. 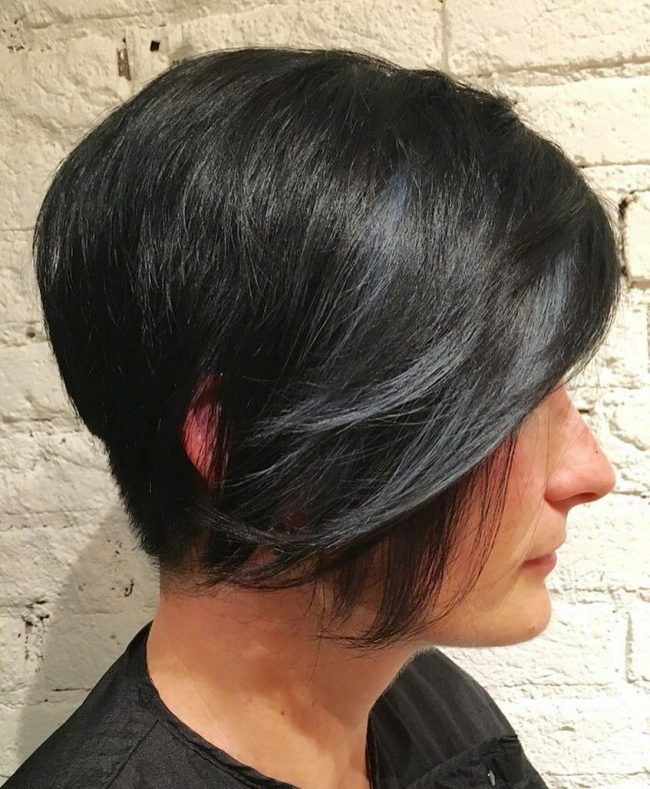 The dark blue shade of these short bangs is incredible, and it makes them look very trendy. Their cut is also fantastic, and it entails leaving some textured locks on the crown that you only need to make messy for styling. And to spice up your look, you will also need an undercut at the back and spice it up with some artistic razor lines. 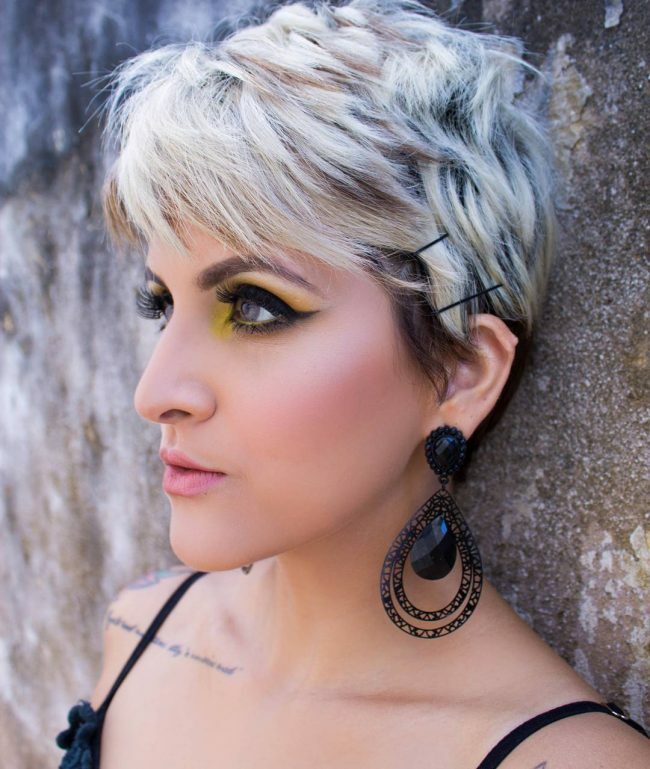 It is very trendy to enhance your pixie haircut with an undercut. 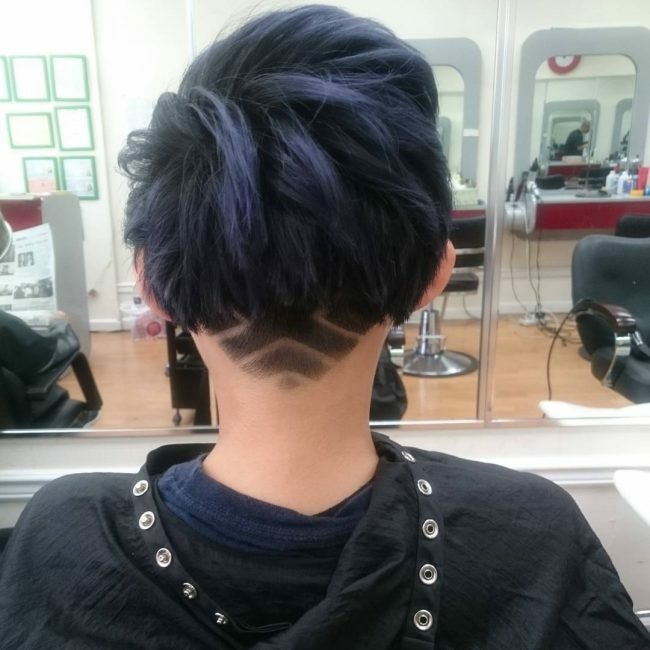 However, the undercut in this one also has a lovely taper, and this adds to the beauty of the style. The long locks also have an amazing texture and a fashionable styling that entails sweeping them to one side in layers. 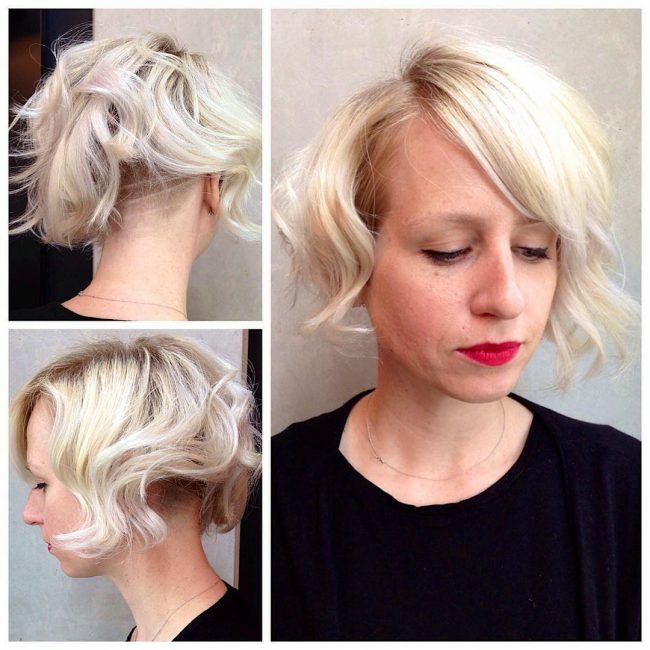 This bob haircut is fabulous, and it shows an inventive way of wearing a pixie. It has a bowl-like design, but the strands are not uniform, and so this makes it a distinct hairdo. This headdress is perfect for ladies who prefer to keep a very short hair and also those who have an extended forehead because its styling makes it possible to conceal this feature. 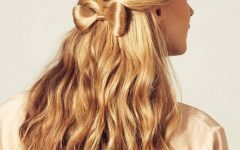 You do not have to do much to create this gorgeous hairstyle. In fact, the only hard part is the styling because the cut is very straightforward. To create this design you should chop your chocolate brown strands to a medium length. You should then give them a soft side part and then style by sweeping some diagonally over the forehead and sweep the rest of the strands to the other side. 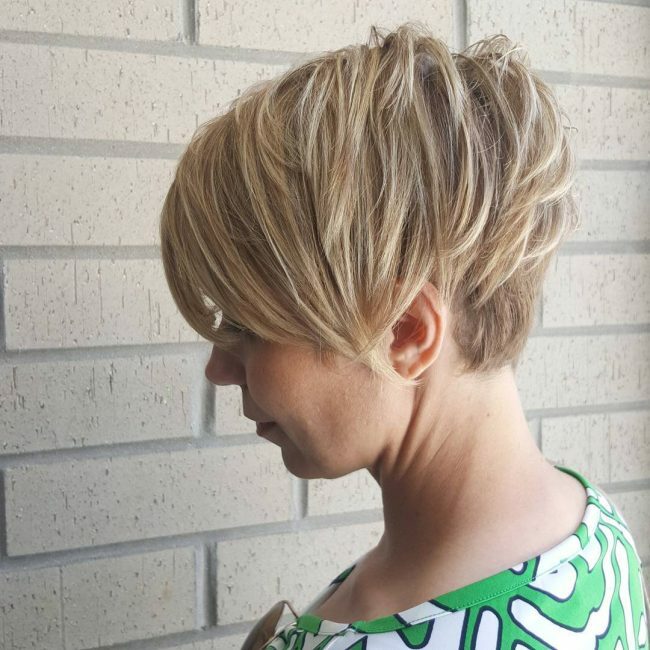 A pixie haircut will give you the freedom to style your strands in almost any way that you wish. And if you also have a bright blonde shade like this one then you can be confident of a head-turning appearance. In this style, the strands are longer at the top than the side and back which you should taper neatly. For styling, you only need to make the long bangs on the crown wavy and then style by up sweeping them to give your headdress some height. 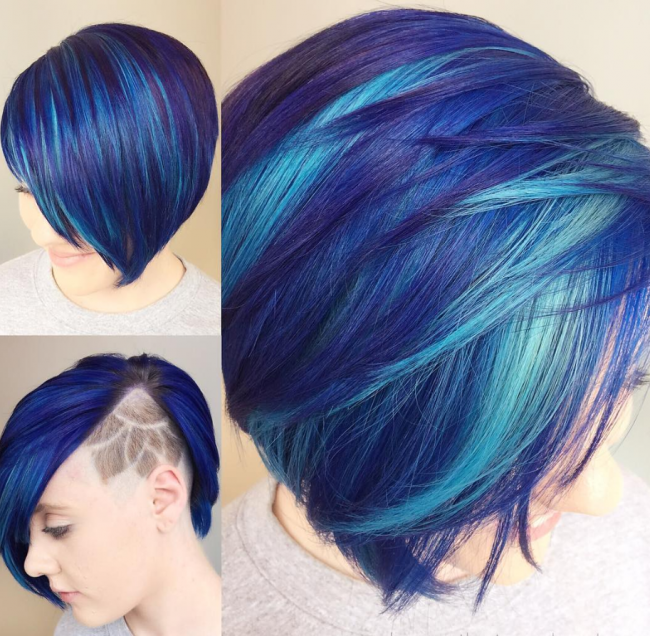 The light and dark blue shades give these bangs a breathtaking tone due to the contrast that they form. However, the haircut is the highlight of the design because it would still look adorable in any shade. It entails leaving some extra-long bangs that are uniform throughout the head and then giving them a faded undercut on the side. You should then have a flower pattern on the undercut using a razor and then sweep your textured blue bangs sideways in layers. A fringe has a way of adding some elegance to your style, and so it is always an excellent addition to any headdress. This design maintains some long bangs on the crown while the back has a moderate taper that ensures that you still keep some length. And for styling you should sweep the top locks over the forehead to form your diagonal fringe. You also need a soft part line just behind the fringe from where you should brush back the rest of your locks to finish the design. Some cherry bangs like these will make you stand out everywhere you go. They are also very easy to create but first you will need to get the cut right and for this, you need to keep some long textured bangs on the crown and taper the back. 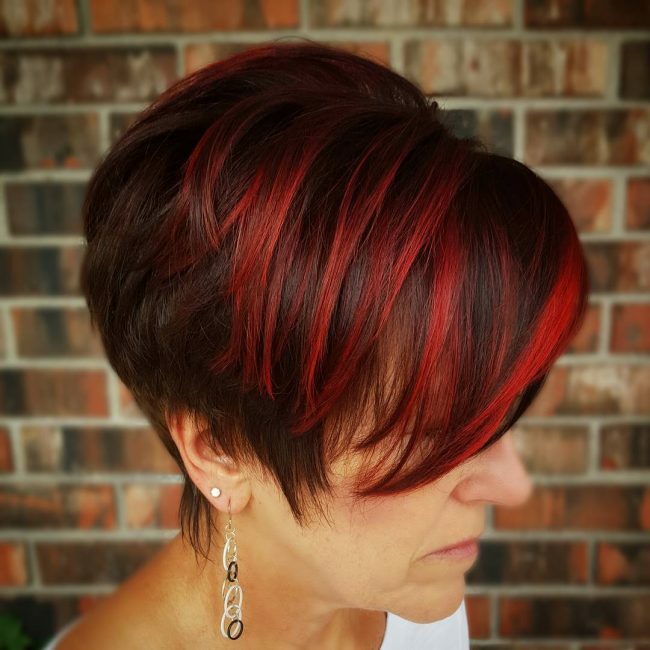 The color is a blend of chocolate brown and the cherry and for styling, you only need to sweep the bangs to the sides and over one eye from a side-part line. Giving your strands a perfect texture will always assure you of a top notch headdress. The blow dry strands in this particular design have an amazing texture that gives them a slightly spiky look. And to style them you should have a moderate part on the side and then give the top strands a windswept look. This design starts by chopping the sides and back short and leaving some long locks on the crown. You should then feather the long locks on the top to make them look and feel light before giving them the lovely silver gray dye job. To finish the look you only need to make them wavy and messy and push them back with your fingers to form an attractive faux hawk design. A fancy headdress like this one is for ladies with a curly hair and it entails trimming it short and in a uniform length. You should then give the locks a dazzling burgundy shade and undercut at the back. And to finish the design you will only need to arrange your short curly strands to form a neat wavy pattern. Side sweeping hair is a fashionable and trendy way of styling it, but if you want to look stylish, it is important first to get a stylish cut. In this design, it entails leaving some extra-long bangs on the crown and buzzing one side to make it appear shorter. This style also requires you to taper the back and for styling, you will only need to sweep the long locks on top sideways. The dazzling black shade of the hair is also lovely as it makes the strands look healthy. 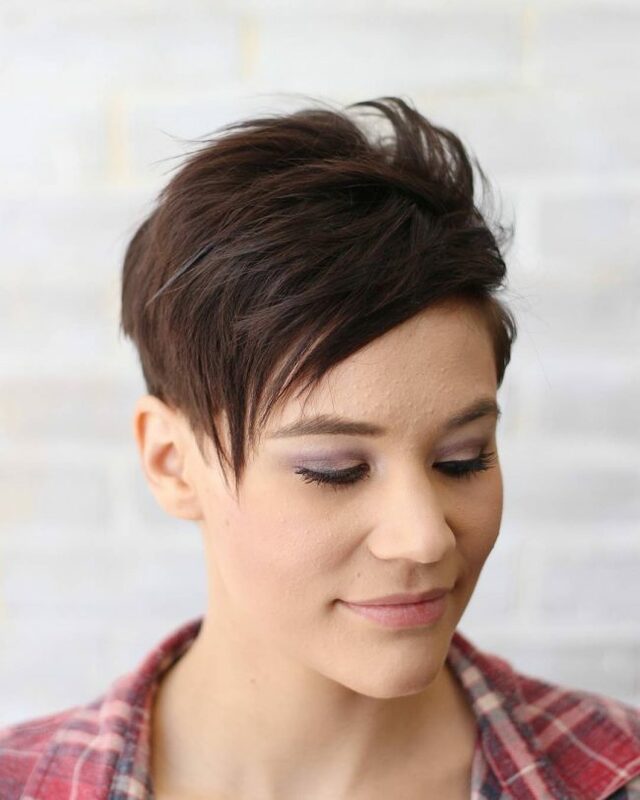 For most ladies, this hairdo will look extra short but for a pixie haircut, it is longer than the traditional one. To create this look, you will first need to chop your strands short and then give them a blend of brown and blonde with the latter being more dominant for a perfect tone. To style the strands, you should form a side part and then sweep your blonde strands over the forehead diagonally. 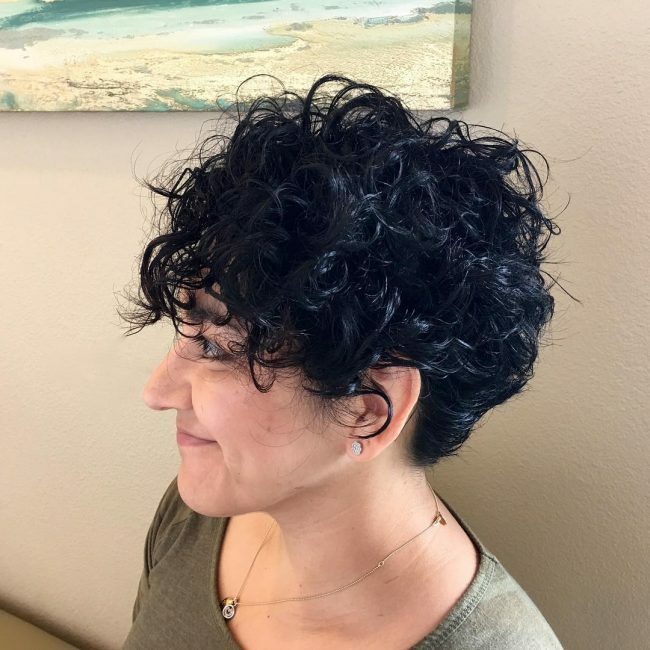 If you are not sure of what to do with your curly strands, then you should try this amazing design if you do not mind going short. The natural curls in this style do not need you to do much for them to look stylish. A simple trim throughout the head to give them a uniform size and running your fingers through them to form a messy look is enough to create an elegant appearance. You have to think outside the box if you want to get a hairdo that will make you look fashionable and stand out from the crowd. 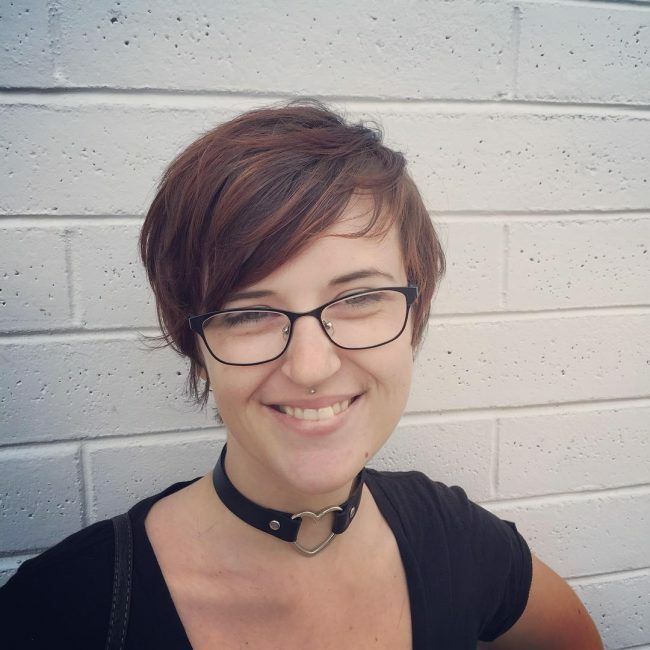 And you do not even have to do anything complicated to get that unique pixie haircut that you desire. In this particular one, you only have to leave some long locks on the crown and then taper the strands on the sides. To finish the haircut, you should comb over the long locks on the top. 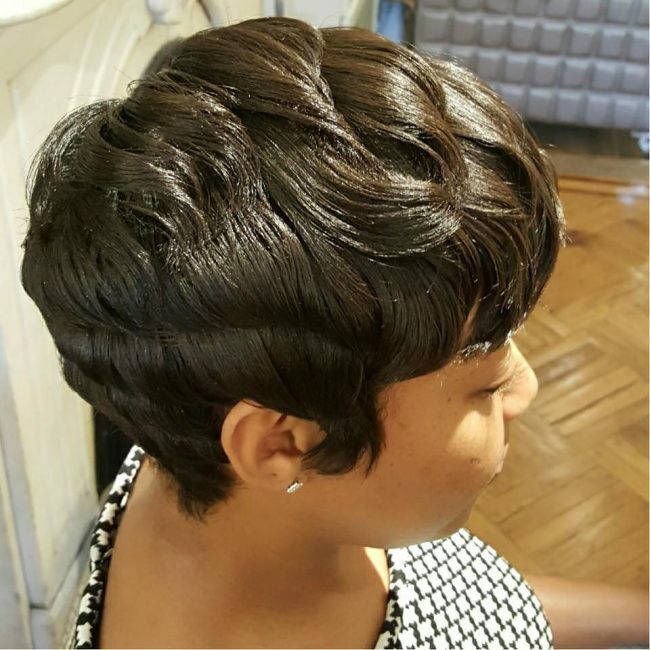 This stunning look comes from innovative cut and styling. It entails chopping some textured locks and giving them a lovely undercut on the side. The styling involves combing over the strands and layering them to create a full appearance. These locks also have a beautiful dark brown shade that helps to spice up the overall appearance of the headdress. Ice blue is one of those shades that you can be sure will make you stand out because you will hardly see any other woman with it. 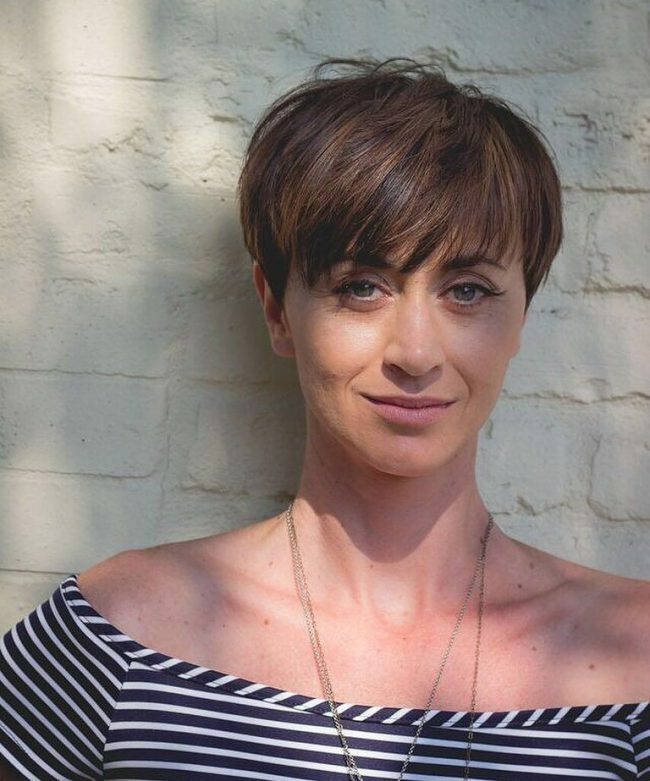 And if you combine it with some beautiful pixie bangs like the ones in this style and a tapered undercut then you can be sure of a top notch appearance. To style your ice blue bangs you only have to make them messy and also give the locks a slight front sweep. This elegant hairdo lets you maintain a decent length, but it also has a stylish undercut that makes it a trendy design. 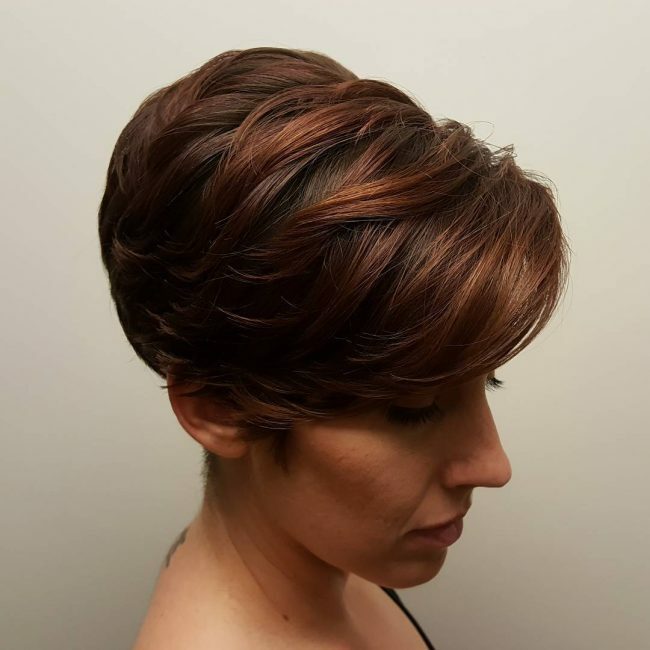 To replicate this fantastic look, you will only have to leave some long wavy strands in the crown and then shave the rest of the head close to form the undercut. It is also a good idea to spice up the undercut with some razor patterns and then style by sweeping your long wavy blonde locks over the undercut. 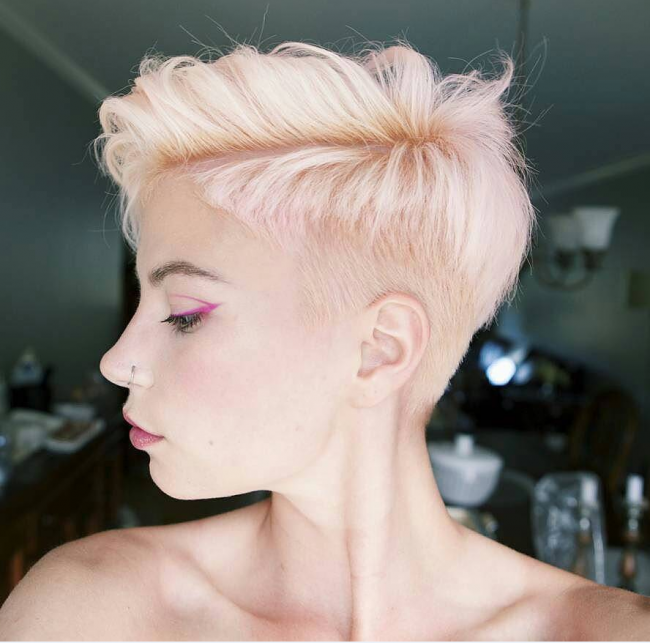 Enhancing your pixie cut with an undercut is the way to go if you want to look fashionable. 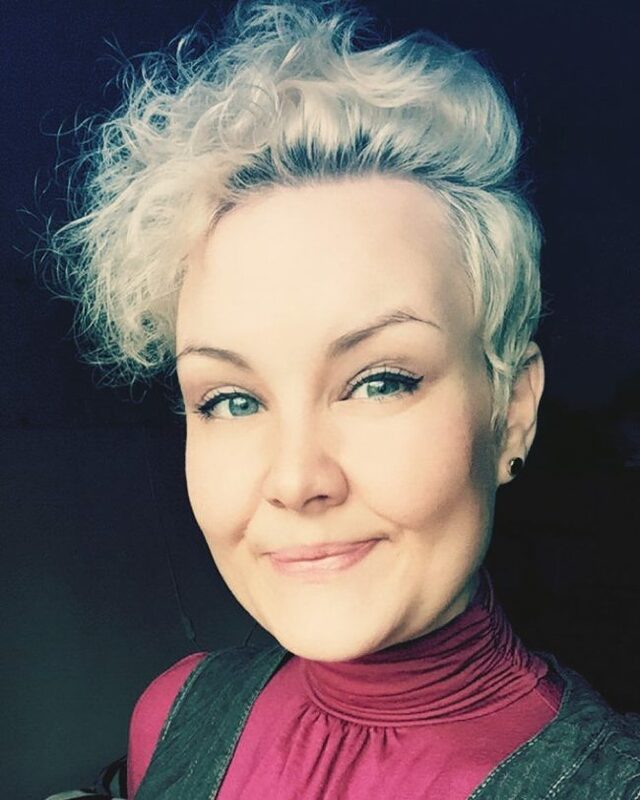 This design, for example, is a typical curly pixie with some wavy locks, but the introduction of the shaved section at the back take the appearance a class higher. However, this style also has a lovely brown shade that gives the strands a perfect tone and also enhances the beauty of the headdress. 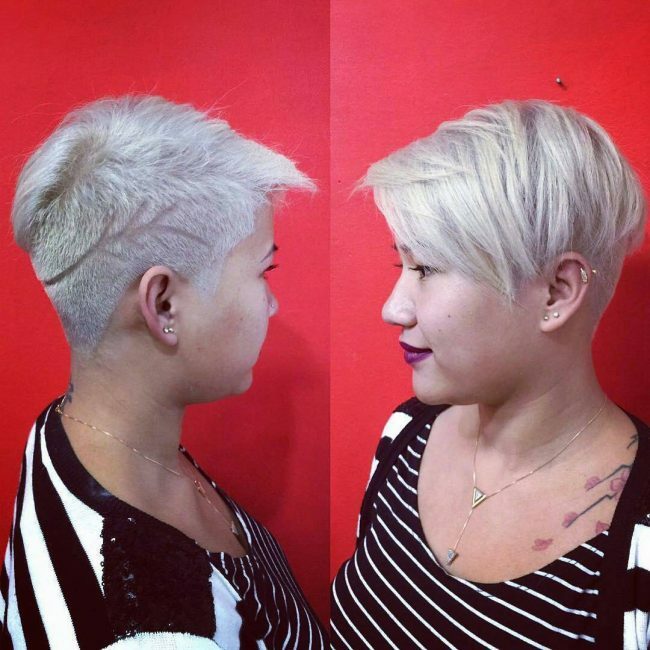 The silver blonde tones on this haircut will steal the attention of most people because it not only gives the design a dazzling shade but it looks excellent on the short strands. But, there is still way much more to the headdress that this and it is important to understand these other elements if you wish to replicate it. And they include the cut that involves leaving some longer locks on the crown and tapering the sides. You also need an artistic flower pattern on the short side and then finish the look with a comb over of the locks on top. A subtle hint of pink on your natural blonde locks is what will give you this gorgeous tone. The cut is also very straightforward because it is a typical long top and short side. However, the trendy look comes from the fact that the sides are not just short, and you should instead taper them and then finish your adorable look with a comb over of the long strands on the crown. Creativity is the only thing that will always guarantee you a unique hairdo like this one. 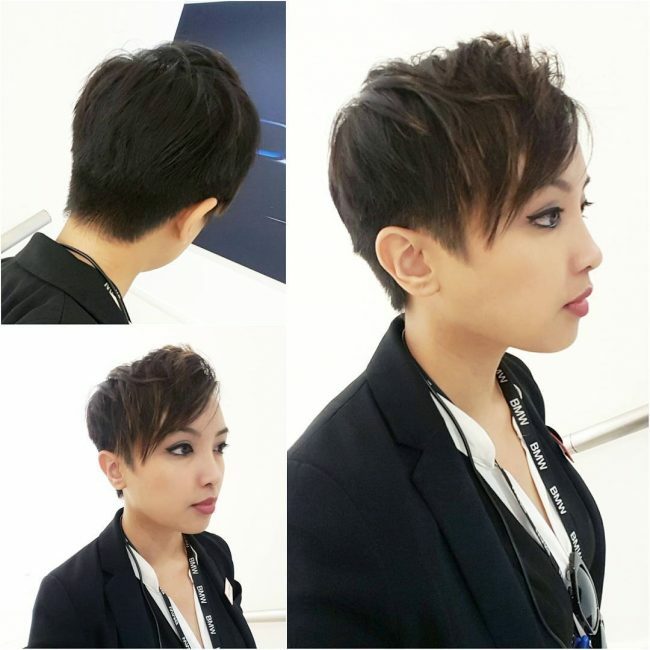 This style maintains some long straight bangs on the crown and some short tapered sides and back. You should then give the sides and back a purple hue and have a golden blonde shade on the front swept bangs at the top. 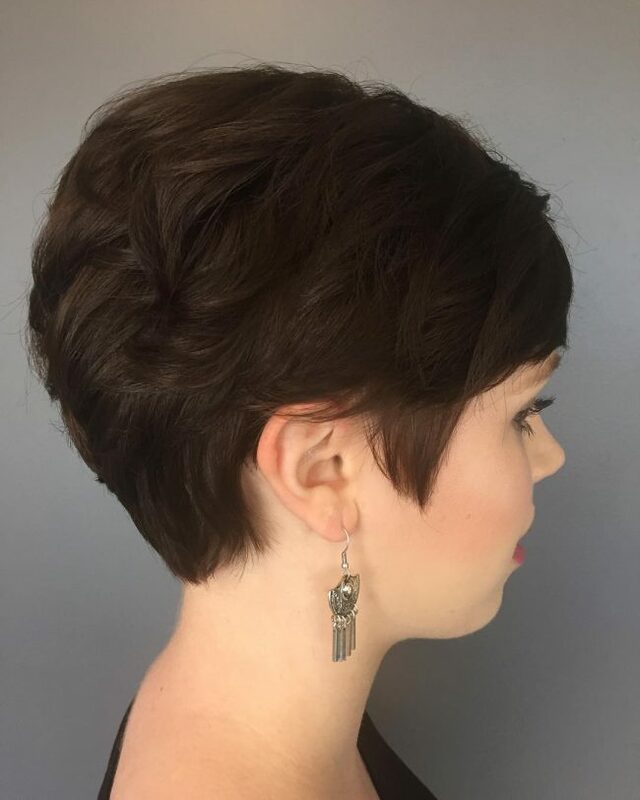 The best thing about a pixie haircut is that it will still look gorgeous even as it is growing out and so you will not need to keep on retouching it. This particular one also has a lovely chocolate brown shade and an innovative side sweep that gives it an adorable asymmetrical appearance. 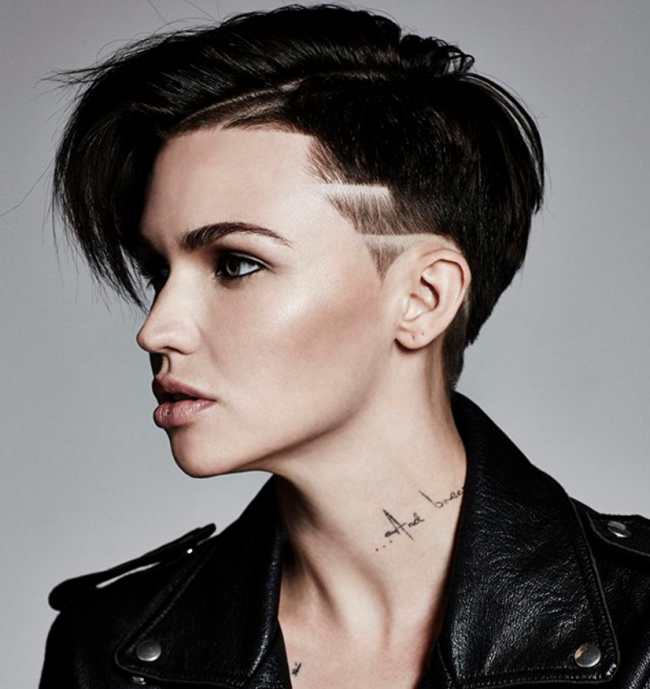 Ruby Rose has a beautiful naturally dark toned hair, and she mostly prefers to wear short pixie. This headdress is one of her typical ones, and it has a comb over styling and an undercut with fancy razor lines on one side. If you have a beautiful face and a lovely hair like Scarlett Johansson you can wear any hairstyle that you wish and still look adorable. 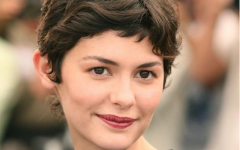 Here she has a very inventive pixie that entails leaving some long bangs on the crown that she styles by up sweeping and rolling back. Scarlett also has a nice taper on the sides that ensures all the attention remains on her sassy style on the crown. 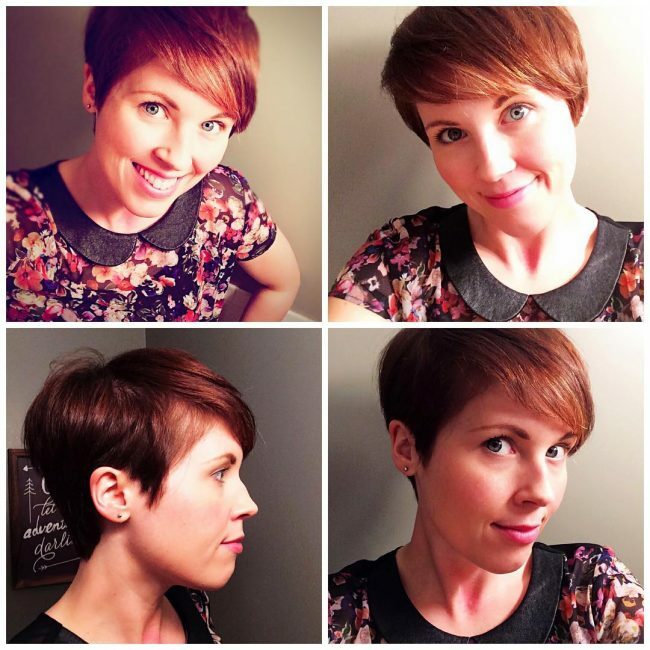 Emma proves that you do not have to do much or complicate things to form a pixie haircut. In this style, she maintains a couple of inches of hair on the crown while tapering the sides. And to finish her design, all that Emma requires is a slight wavy side sweep from her soft side part line. However, she also has a beautiful chocolate brown shade that adds to the elegance. 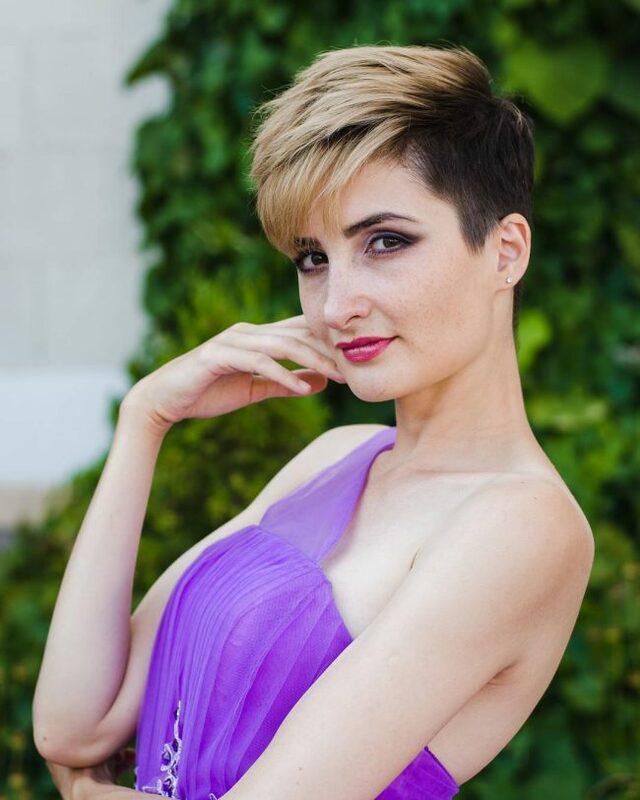 It does not matter how short you make your pixie because it will still look adorable if you chop and style it innovatively. Here Jennifer Lawrence has an extra short one that she creates by maintaining some short front swept bangs on the crown and by tapering the back. Her strands also have a gorgeous brown shade that goes well with her skin tone. Halle Berry prefers to go with a short hairdo and in this style, she has some sweet textured curls. Her styling is very simple, and she only has to trim the swirls to make them uniform and finish by finger combing for a messy appearance. 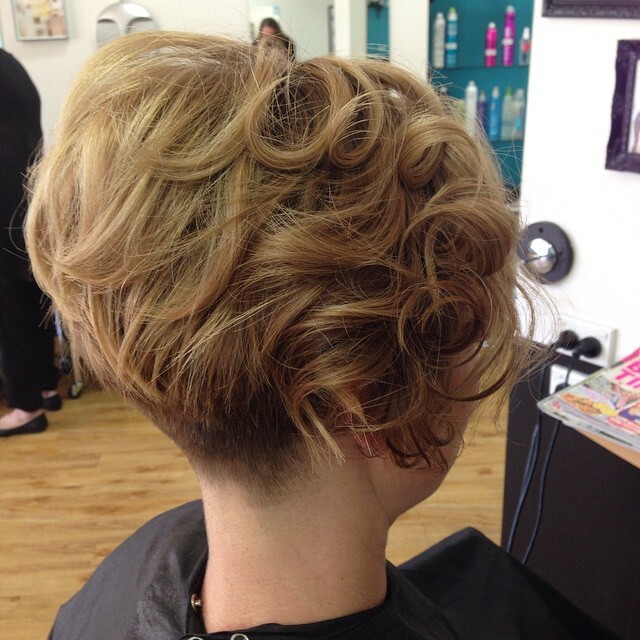 Here is another example of the elegance that you can create by growing out your short pixie hairdo. In this hairstyle, Charlize Theron only has to grow out her uniform pixie design and then style by sweeping the bangs on the crown frontwards in subtle layers. However, her strands also have a beautiful and bright blonde shade that also spices up the appearance. Rihanna is one of those celebrities that are always experimenting with new looks, and she is very lucky because almost everything that she wears always makes her look adorable. 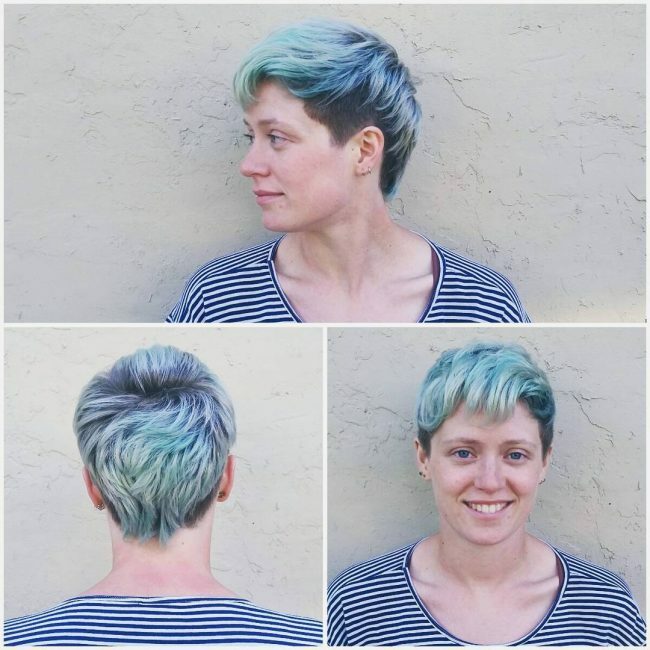 In this style, she has a unique pixie design that entails leaving some long locks on the crown and tapering the back. She then styles the long locks by sweeping them to the front and over her face. The strands also have a shiny black shade that gives them a healthy appearance. This medium pixie headdress works perfectly for Carey Mulligan’s round face. It entails chopping her strands to form some textured bangs that she then styles with a side part and a cute diagonal side sweep over the forehead. The bangs hug her round face to bring out all her beautiful facial features. Victoria Beckham has a traditional long pixie in this hairdo, but she enhances it with and undercut to make it look distinct. 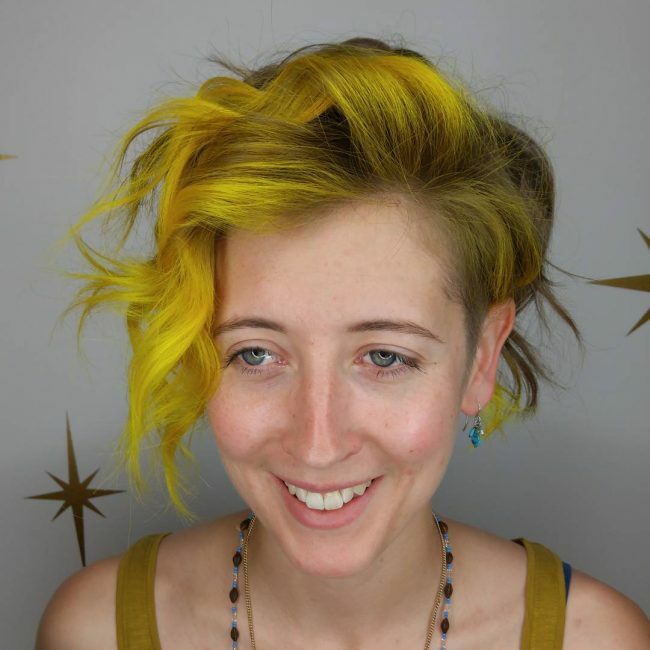 Apart from this she also makes her textured strands wavy and styles them over the undercut to create a cute face framing design. 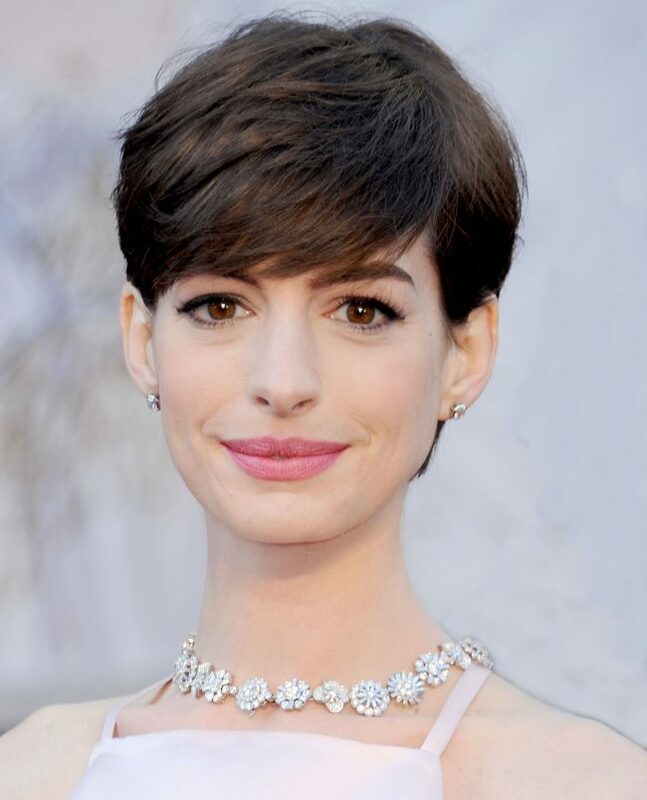 A sleek hairdo does not have to be sophisticated, and this Anne Hathaway hairstyle proves this beyond any doubt. She does not overdo anything in this style as she only tapers the sides while leaving some long strands on the crown that she styles with a sweep over her forehead. 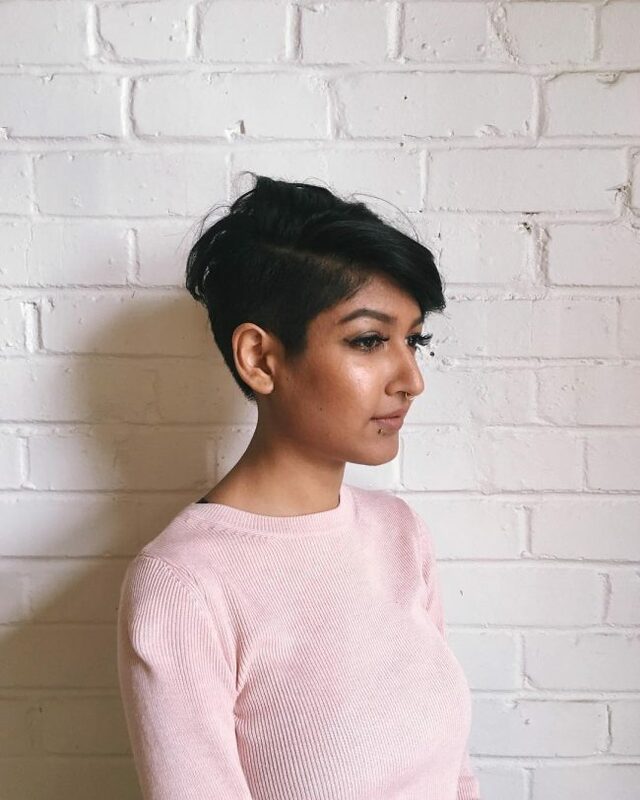 A pixie haircut comes in different shapes, and it is one of the best hairdos that a woman can have when she wishes to chop her mane short. 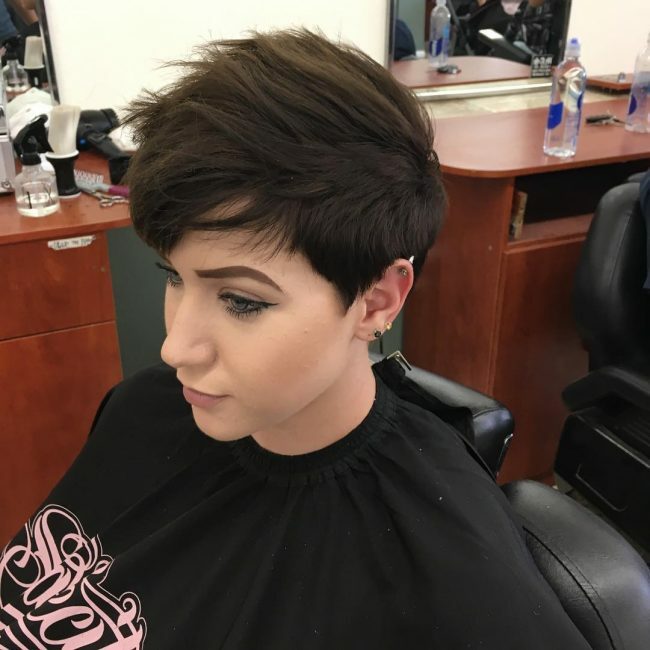 It is also a very trendy and classy design and so if you are thinking of going short you should try one of the 50 trendsetting styles above.